BEAUTIFUL HOME LOCATED AT CREEKSIDE PARK, FEATURES LENNAR TERRAZO FLOOR PLAN. THE HOUSE IS AN OPEN FLOOR PLAN WITH A FORMAL DINNING ROOM, A FAMILY ROOM WITH GASLOG FIREPLACE, THE KITCHEN HAS GRANITE COUNTERS & STAINLESS STEEL APPLIANCES, FIRST FLOOR INCLUDES A SPACIOUS OFFICE SPACE TOO. MASTER BEDROOM WITH SLIDING DOORS INTO BACKYARD, BATHROOM WITH GRANITE COUNTER TOPS AND SEPARATE TUB & SHOWER. UPSTAIRS 3 BEDROOM WITH 2 FULL BATHROOMS AND A FOURTH ROOM USED AS A GAME ROOM THAT COULD EASILY TURN INTO A 5TH ROOM FOR BIG FAMILIES. BIG BACKYARD WITH TREES AND ENOUGH SPACE TO BUILD A POOL. BRING US YOUR OFFERS, HOUSE PRICED COMPETITIVELY. Directions:FROM I-45 NORTH EXIT WOODLANDS PKWY, SOUTH ON KUYKENDAHL, TL ON CREEKSIDE GREEN, TR ON W NEW HARMONY, TR ON SAWBRIDGE CIRCLE. SchoolsClick map icons below to view information for schools near 18 Sawbridge Circle Spring, TX 77389. Listing provided courtesy of Winhill Advisors - Kirby. Home for sale at 18 Sawbridge Circle Spring, TX 77389. Description: The home at 18 Sawbridge Circle Spring, TX 77389 with the MLS Number 58618700 is currently listed at $345,000 and has been on the Spring market for 73 days. 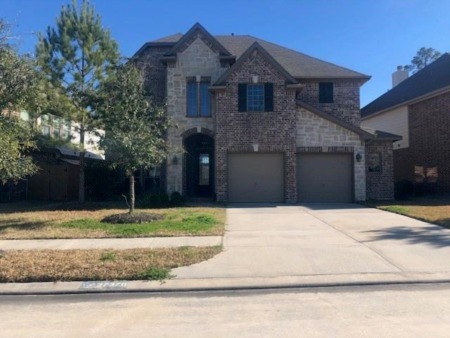 You are viewing the MLS property details of the home for sale at 18 Sawbridge Circle Spring, TX 77389, which is located in the The Woodlands Creekside Park 29 subdivision, includes 4 bedrooms and 4 bathrooms, and has approximately 2596 sq.ft. of living area.